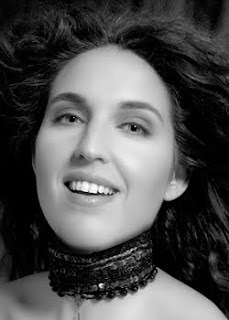 Paris-born soprano Norah Amsellem made her Seattle Opera debut in 2004 as Gilda in Rigoletto, and returned in 2008 for Elvira in I puritani. She's singing Micaëla in our opening night cast of Carmen, and we talk to her about her recent world travels, singing in her native French, and collaborating with Domingo in Carmen as a kid and as an adult. You recently did a recital at the Hanoi Opera House with Fernando de la Mora, our Sunday/Friday Don José. What was that event for? Have you had much opportunity to travel around Asia? It was for Moët & Chandon champagne and cognac, actually. The Moët & Chandon group have a huge concert series there, so Lang Lang played last year and we were invited to do a concert there in the series. We did duets and trios and opera scenes and arias and all that, which was great. Fernando went on a tour of Vietnam afterward and enjoyed that very much, but I couldn’t explore because I had to go back to the Vienna Staatsoper to do a Manon with Roberto Alagna. I’ve spent a lot of time in Japan, though, and I’m going for the first time to Beijing to do a concert tour there in December. I’m looking forward to it, because it’s too far away to go just for fun—I never have time! And I’ve decided to go a little early with my fiancé, and we’re going to spend a bit of time sightseeing. So far, the Seattle Opera audience has only heard you singing in Italian. Do you prefer singing in your mother tongue, French? I like both. Of course, Italian is easier for the voice, but I sing a lot in French so I better not mind it! 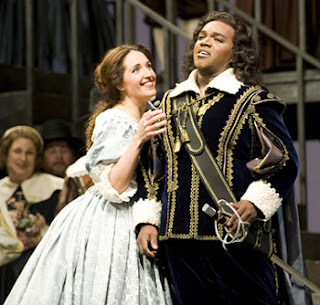 Norah Amsellem (Elvira) and Lawrence Brownlee (Arturo) in Seattle Opera's 2008 production of I puritani. Tell us about your character, Micaëla. For the first hundred or so years, the basic interpretation of this opera was that Micaëla was a good little girl, a foil to the naughty girl, Carmen. Is that the way you see it? It can change based on the production. Micaëla is not who I think she is, it’s whoever she is for that production. She can be a drug addict or she can be a sister going into a convent; she can be many different things. However, this is a fairly traditional production. She’s an orphan who has been taken under the wing of José’s mother, and lives with her. She goes every day to get the water and to cook, so it’s not exactly a fun life. She’s a bit of a country girl, in a very small village taking care of an old lady. So of course when she goes to Seville to see José, she’s probably been there maybe once before, if at all. For her, it’s wonderful and it’s scary. As soon as she gets there, she hesitates to ask for directions and she gets assaulted by these men, so it’s a bit scary for her— but she’s also a tough girl, I think, because of all she’s been through in life, so she doesn’t scare easily. And later she does something not everybody would be willing to do—go up into the mountains to find José. Mariusz Kwiecien (Riccardo) and Norah Amsellem (Elvira) in Seattle Opera's 2008 production of I puritani. How does she feel about José toward the end of the opera? She still of course feels something for him at that point, she still has tenderness toward him, but I think she’s given up on seeing any kind of love with him because of what happened with his relationship with Carmen. I think Micaëla realizes that José doesn’t love her in that way that she loved him. She calls him “the one I have loved before” in her aria. You have a young son; do you ever sing to him? Norah Amsellem (Gilda) with Kim Josephson (Rigoletto) in Seattle Opera's 2004 production of Rigoletto. At what age did you become interested in performing opera? Beginning when I was eight or nine years old, I sang in a quite well-known children’s chorus in Paris. And, actually, I did the children’s chorus in Carmen with Placido Domingo and Julia Migenes in the movie they did. And then I sang it with Domingo in 2000 for the opening of the Met season and I told him, “I sang the children’s chorus with you!” It had always been my dream to sing with him, and it happened! So that was great.